Enfold us, Lord, in your love, surround us with your peace, encircle us with your power. Enable us to be what you would have us be; empower us to do what you would have us do; through Christ our living Lord. Amen. The “Tale of Two Cities” opens with a journey from England to France to rescue Dr. Alexander Manette who has been held in the Bastille prison for 18 years because of a secret he knew about a powerful Marquis. While in prison, he makes shoes as a way of keeping his sanity. As a survival technique. When he is finally released, he has difficulty making sense of the greater world and prefers to stay locked in his room using his shoe making tools. He is reunited with his daughter and taken to England to rehabilitate. Gradually he begins to assume a normal life and return to the man he once was. But in moments of stress, he returns to his old pattern of shoemaking and once again becomes like the prisoner of the Bastille. In some ways, Dr. Manette makes me think of the ancient Hebrews who were enslaved by the Egyptians. They learned how to survive in Egypt by mimicking the culture of Egypt, by living into the rhythms of Egypt. Then God rescues them and begins to lead them home to the promised land. Yet in moments of stress and fear, they revert to their Egyptian ways and thought patterns and even long to return home to slavery. The rhythms and patterns of enslavement are deeply ingrained in them and form part of their identity. So it is difficult for them to actually live as the free, covenant people of God. At Mt. Sinai, the Lord will speak through Moses to the people and give them the gift of Torah, the Law, the way of life of the covenant people of God. This way of life involves instruction about worship, festivals of remembrance, sacrifice, family life, community life and more. At the heart of it, they are learning how to be the covenant people. The family adopted by God as his blessed people. The Shema forms the heart of the law. As the blessed family of God, they are learning how to live into the very love of God. This instruction begins to train them in the very shape of love. The love being showered upon them by the Heavenly Father is a free gift. He has adopted them into his family. He is teaching them the way of the family. And this family will eventually become a blessing to all families on the earth, bringing the good news of God’s love and redemption to all the peoples of the earth. But like Dr. Manette, they continue to return their old lives and acts of slavery. This pattern of return, of mimicking the ways of Egypt and Canaan will happen through the stories of the Old Testament as they turn to Baals and other idols of the land. This command begins with the blessing, the adoption, the rescue. The Lord rescues them from the house of slavery and says you shall have no other gods before me. This command is a blessing as much as a comment. It is a reminder to this new family that the Lord is their father, their provider and not Pharaoh and not the gods of the Land, and not the powerful rulers of the land. Every other father will enslave them or sacrifice them. Only the Lord, the Adonai, will care for them as a true father. Adonai is a word for Lord often used in place of the covenant name of God, YHWH. Adonai is adapted from the name Adon, which also means Lord but refers to a human Lord or ruler. The ai on the end indicates divinity. The word Adon derives from the word for parent. Adonai is the divine parent, the divine ruler who cares for his people as a true father. All of fathers or gods will use the people, control the people, enslave the people, and eventually corrupt and even kill the people. The Lord has rescued his people from slavery and now calls them to a way of love. I say all this by way of introduction. In today’s readings, we have three covenant communities: the ancient Israelites, the disciples, and church at Corinth. Each of them are called into the blessing of God, the love of God, the family of God. Each will also face temptations to return to the old ways, to live like the world around them. Like many of the prophets, Micah comes to remind the people of who they are. The people have forgotten who they are. They have adapted the cultic practices of cultures around them, and they are using idols as a part of their worship. They have adapted to the ways of the peoples around them and have becomes oppressors, playing power games. They continue to call upon the Lord, but they act like he is a powerful charm that protects them. They look and act like the enslaved and enslaving cultures around them. Micah reminds them of their story of rescue from Egypt. Then we have the question, what does the Lord require? 6 “With what shall I come before the Lord, and bow myself before God on high? This question has reduced the Lord to idols of the land. Like he is a transactional god. Thousands of rams, ten thousands rivers of oil. These are virtually unattainable. The worshipper even asks, if the Lord requires human sacrifice? Shall I give my firstborn? Live as the covenant people that you are. Remember that you are caught up in God’s love. Extend that lovingkindess to the community around you. Now we jump over to this newly emerging family in the gospel reading. Israel is no longer an independent nation. She is a subject of Rome. She longs for the Messiah to come and defeat the powers that be and restore the nation to glory. Jesus comes as the Messiah, the Christ, the King who will restore the people. But he does not take on the powers of Rome. He comes to restore the lost sheep of Israel, and in so doing he will also restores the Gentiles as well. In his life, death and resurrection, He will open the blessing of God to all families. He gathers disciples to himself who will form the beginning of this new family that will one day be made up of Jews and Gentiles. In today’s passage, he is teaching his gathered disciples about the way of this new community. Much like the promises of Torah in the Old Testament, he begins with blessing. He will live out the full reality of all these beatitudes in his own life. As he looks out at his disciples, he sees a family that will embody his life and teaching. They will literally become the body of the Christ in the world. In 1937, Dietrich Bonhoeffer wrote a book on the Cost of Discipleship. In the middle of Nazi Germany, he reminds the Christian community what the way of discipleship looks like. For him, the call of discipleship is ultimately a call to come and die. To follow Christ in the way of the cross. 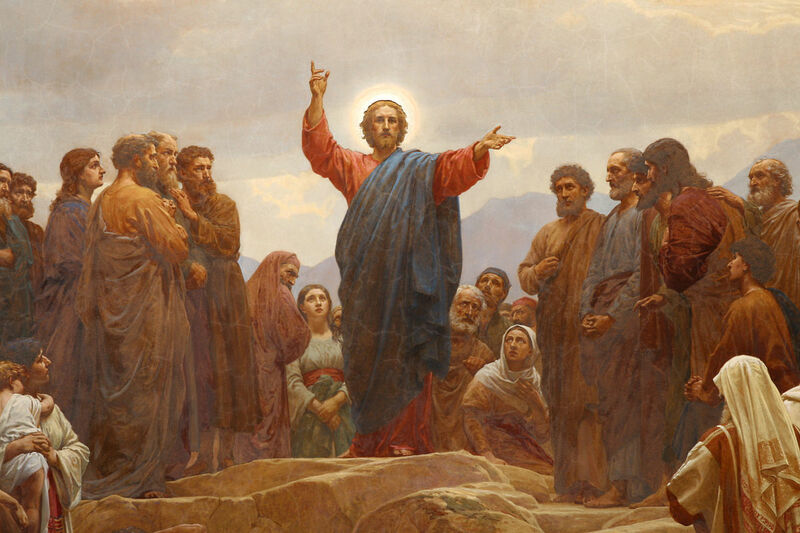 As he reflects on the Beatitudes, his reflects on the disciples who have entered the blessed community, who are loved and blessed even though they may experience want and weakness. They will look weak to the world. Sometimes mourning over their own sins and weakness as well as mourning over the brokenness of the world, but they will be blessed. The blessed people of God. Instead of reverting to the power games in the culture around them, they will be merciful, meek, peacemakers. As they grow into the love of God, they will look odd and powerless to the world around them, but they are blessed of God. And they bring his blessing to the world. These beatitudes remind them and us that we have been adopted into a family. We are a royal priesthood meant to bless and pray for the world around us. But our identity is not in power structures around us. Our identity is rooted in the love of God in Christ. We will know what it means to hunger and thirst for righteousness, for God’s true justice and sometimes we will grieve that God’s justice is mocked on the right and left. We will be told that it is foolish to long for kingdom of God. We may be tempted to adapt to the ways of the culture to make the kingdom of God. We may be tempted to belittle though we disagree with, we may be tempted to curse those who oppose us. We may be tempted to use power games to bring the kingdom forth. In the midst of the striving around us, we must remember who we are, remember our story of redemption. Ancient Israel’s story has become our story. We were enslaved by Pharaoh, but God rescued us and brought us into his family of love. We are the blessed family called to bring his blessing, His Gospel, his hope to the world around us. We serve the world as a family rooted in the cross of Christ. So we come the final reading. This New Testament passage finds our identity in the cross of Christ. The people of Corinth have tried to find their identity in status, wisdom, gifts, power and are tempted to fall into the ways of the culture around them. Paul reminds them in first and second Corinthians that the people of God often look and feel weak. Our hope is in the absurd story of God coming in Christ, dying on the cross and rising again. Our hope does not make sense to Jew or Gentile. The power and wisdom of God looks like weakness and foolishness to the world around us. And it will be tempting at times to seek for another power. We are called to live in the middle of a culture that seeks for identity and status and power in patterns that dehumanize and ultimately corrupt the human heart. We live in the midst as a people who are blessed, who are loved, who have been freed from slavery and are free to love God and one another. We live as witnesses to God’s goodness and blessing in the midst of the world. So we rehearse and remind ourselves afresh who we are in Christ. When we gather, we encourage one another and share the gifts God has given us. We are learning how to bless and pour out our lives for one another. At times our identity will feel weak and insubstantial, but we turn to Christ, we find strength in the community, we seek to live as the people blessed of God and blessed to pour out his blessing on our neighbors. Adam, David (2001-08-01). Clouds and Glory: Prayers for the Church Year, Year A (pp. 36-37). Church Publishing Inc.. Kindle Edition.